Evolved from a PSN title to a disc-based release, Sony's newest PS3 game, Tokyo Jungle has caught the attention of many with its interesting urban environment, animal survival concept. But does this title bring gameplay equal to its unique narrative base or does it never completely manage to escape its budget title roots? 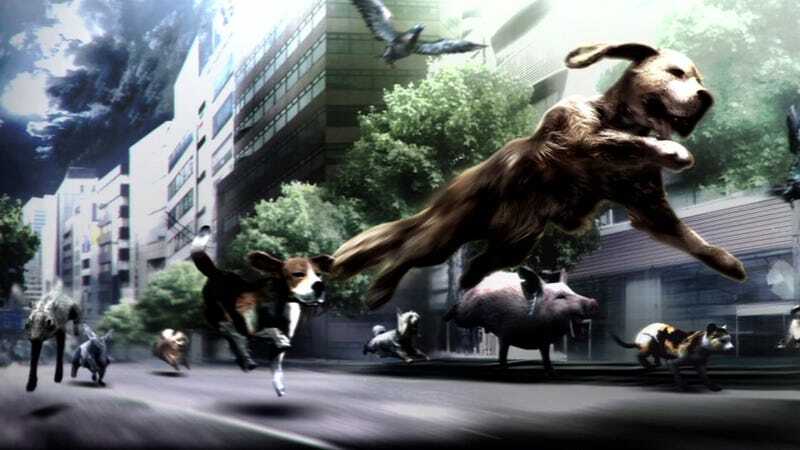 Tokyo Jungle is based around one single question: What would happen if one day humanity disappeared and Tokyo was left to the animals? From the eyes of a lowly Pomeranian to those of the king of the dinosaurs, Tokyo Jungle shows you the largest city in the world devoid of human life. Following the animals left behind, you experience not only their individual stories in this new urban jungle, but also uncover the mystery of humanity's disappearance piece by piece. It's a compelling premise for a game, and Tokyo Jungle handles the dual narrative quite well. While there is a 14 mission story mode, you'll be spending most of your time with Tokyo Jungle in survival mode (for reasons we'll get into later). The point of the mode is, just as you may have guessed, to pick an animal and survive as long as possible. To prevent this from becoming monotonous (given how many times you will play this mode) you are given a set of random objectives to accomplish in each ten minute chunk you survive. The challenges reward you with stat bonuses and occasionally unlock clothing or even a new playable animal. The other animals and food present in each area randomly change every ten minutes as well insuring that no playthrough will be identical to any other—even if you're playing the same animal. Tokyo Jungle touts an amazing lineup of 52 animals—more if you count those animals with several unlockable skins. You can be everything from a deer to an elephant on the herbivore side and everything from a Pomeranian to a T-Rex on the carnivore side. Sadly though, herbivore or carnivore, all animals play basically the same. The only meaningful difference is size and thus how much damage you do. Therefore unlocking animals simply moves you up the food chain, nothing more. course, some of the reports are in areas that will require something a bit stronger than a deer or Pomeranian (the only two animals unlocked at the start) so you need to stick around in survival mode long enough each time to unlock the next level of animal. But even after you unlock the next animal in the food chain, you can't actually use it. First you must pay for it using the points you collected in survival mode by completing challenges and simply staying alive. Clothes (which act as armor and weapons) can also be purchased using points. So really, each time you go into survival mode, you need to try to survive as long as possible or you will be destroyed by the sudden difficulty spike at the end of the game. Without going into spoilers, the location of the final four data reports is infested with enemies far stronger than any animal sans the dinosaurs—which are, of course, the final unlock. I was about 3/4 through the carnivore unlocks and had had no difficulty issues with the game until this point. Yet, suddenly I was unable to progress. Rather than play the five or more extra hours minimum it would take to unlock the dinosaurs, I took the fastest character I had—the cheetah—and kept trying to sneak/run past the enemies. After about the fifth try (and 2nd hour) the area was sparsely populated enough for me to succeed. I have no doubt that this was total luck and the game was trying to force me to play survival until I unlocked the dinosaurs. All it made me want to do, however, is never play the game again. because they are poorly designed but rather because they lack proper check points. Each stealth level has perhaps one checkpoint in its entirety and since being seen automatically ends the mission, you'll spend an inordinate amount of time doing the same section over and over. Between the repetition and the loading times, it becomes far more frustrating than fun. Tokyo Jungle is a real mixed bag. Here in Japan it was released as a semi budget title—costing about half the price of most PS3 titles—but I am on the fence about whether it was worth the money. For everything unique or enjoyable, there seems to be something uninspired or monotonous. While it's true "the more I played it, the more I enjoyed it," (especially the pseudo Lion King segment), the final stealth level and sudden, eye-rolling difficulty spike brutally murdered the fun, leaving nothing but a corpse full of hate. If grinding for unlocks is something you find enjoyable, then this is probably a game you will enjoy. If you were looking forward to the story and messing around with a bunch of different animals, it's safer to give this one a pass. Tokyo Jungle was released in Japan on June 7th on the PlayStation 3 and is scheduled for a Western release later this year.